HomeBlogHIPAA Risk Analysis Tip – What Level of Detail is Adequate? HIPAA Risk Analysis Tip – What Level of Detail is Adequate? 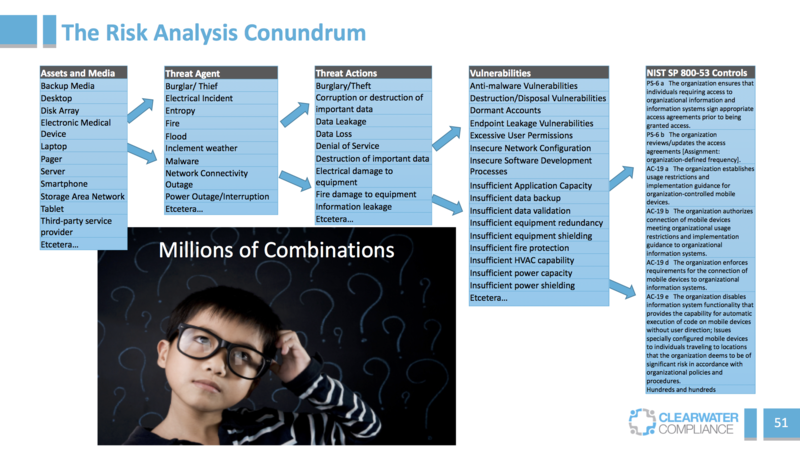 Short Answer: Every “asset-threat-vulnerability” combination must be risk-analyzed! In order to conduct a thorough and accurate risk analysis, it’s imperative to identify the threat sources, threat events and vulnerabilities that might compromise the confidentiality, availability and/or integrity of the health information entrusted to your care. That means all the systems, applications, technology solutions, biomedical devices etc that create, receive, maintain and transmit ePHI. The combinations of assets/media, threat sources, threat events, vulnerabilities and controls is mind-boggling. 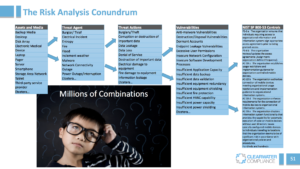 Over simplifying, suppose one had address risks associated with 10 assets, 10 different threat sources, 10 threat events, 10 vulnerabilities and 10 controls, the number of combinations is 100,000. Not possible to keep track of on an excel spreadsheet! And, our worlds are not that simple. Has the entity conducted an accurate and thorough assessment of the potential risks and vulnerabilities to the confidentiality, integrity, and availability of all the ePHI it creates, receives, maintains, or transmits? Has the entity implemented security measures sufficient to reduce risks and vulnerabilities to a reasonable and appropriate level? Evaluate and determine if the documents identify how risk will be managed, what is considered an acceptable level of risk based on management approval, the frequency of reviewing ongoing risks, and identify workforce members’ roles in the risk management process. Obtain and review documentation demonstrating the security measures implemented and/or in the process of being implemented as a result of the risk analysis or assessment. Evaluate and determine whether the implemented security measures appropriately respond to the threats and vulnerabilities identified in the risk analysis according to the risk rating and that such security measures are sufficient to mitigate or remediate identified risks to an acceptable level. We’ve seen time and time again that OCR has not been happy with the accuracy, thoroughness or comprehensiveness of the risk analysis and risk management programs undertaken by organizations they have investigated. This indeed is a lot of work. Find a platform that makes this critical endeavor less cumbersome, more constructive and gives OCR exactly what they are looking for. Download the OCR-issued “Guidance on Risk Analysis Requirements under the HIPAA Security Rule” .